For eco-fashion designers who want to sit at the cool kids’ table, a couple of tenets are sacrosanct: 1. Thou shalt not make anything that looks like it should be smoked at a Grateful Dead tribute concert, and 2. Thou shalt not create “trashion” that resembles something the cat purloined from curbside pickup. Paola Volpi, an avant-garde jeweler who lives in Rome, knows how to play by the rules, despite the unusual nature of her materials, which include industrial and automotive oil filters that she turns into fluid, woven wearables. 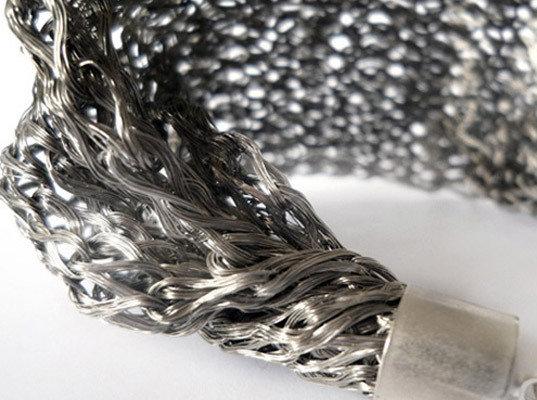 Volpi turns industrial and automotive oil filters into fluid, woven wearables. The erstwhile stage costume designer doesn’t just improve the social standing of machine parts. Volpi also elevates electrical cables, rubber bands, zippers, washers, and nuts and bolts into objects of unexpected refinement. For eco-fashion designers who want to sit at the cool kids' table, a couple of tenets are sacrosanct: 1. Thou shalt not make anything that looks like it should be smoked at a Grateful Dead tribute concert, and 2. Thou shalt not create "trashion" that resembles something the cat purloined from curbside pickup. 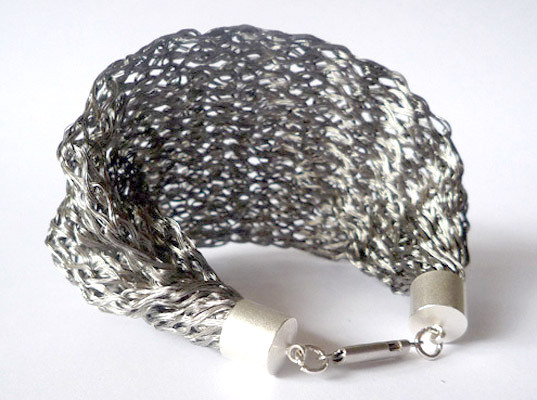 Paola Volpi, an avant-garde jeweler who lives in Rome, knows how to play by the rules, despite the unusual nature of her materials, which include industrial and automotive oil filters that she turns into fluid, woven wearables.